Food, arts, crafts, fashion... all under one roof - Why Not? whynot? is a new kind of retail business model that has been widely admired as a solution to declining footfall on high streets. ​With over twenty independent retailers under one roof along with an excellent cafe and delicatessen whynot? is a place that the local community love and where visitors come back to again and again. 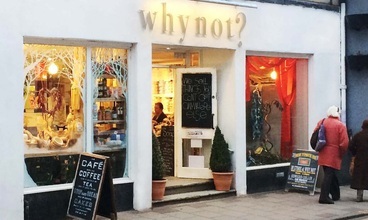 ​The first whynot? opened in North Berwick just over five years ago and will soon be joined by a second branch in Galashiels in the beautiful Scottish Borders. For customers... whynot? is a unique opportunity to browse and buy locally produced and sourced products and services not seen before on the high street... all under one roof. For producers... whynot? means you can become part of a great community of small businesses without the huge financial outlay and time commitment of having a full-time shop of your own. You can rent your own space for just a day at a time or a weekend or a week or a month - as long as you like! Or you can simply let us do the selling on your behalf. You don't even have to be there! For everyone... whynot? is a place to gather and meet like minded people who want to share in the revival of the high street... a place that serves them well and belongs to everyone. whynot? has its own comfortable café where you can sit down and relax with a coffee or tea and a slice of cake or a sandwich or why not let us serve you a take-away and you can wander off around town or to the beach? Our menu is here. whynot? is open from 10am to 5.30pm Monday to Saturday. 11am to 5pm Sunday.